A wet bag is always useful to put wet diapers/trainers in while you are out and about or to use in your diaper pail to make for easy clean up. If you make the wet bag from PUL you can throw it into the washer and dryer along with your diapers and have it nice and clean to be used again for the next outing. Other materials suitable for a wet bag: fleece, 100% wool (lanolized), or rip stop nylon. Here are instructions to construct your own wet bag from PUL, a shoe lace and a toggle. Download pattern. Some download times are long. Here is a large version of the pattern. The great thing about this pattern is that you can easily make it any size. By increasing or decreasing the width or height of the pattern (in the middle of the pattern) you can tailor the size of your wet bag to your needs. You can make it fit a large diaper pail or a small diaper bag. The downloadable pattern is small because this was the easiest to digitalize, to make a larger version just add inches to the center of the pattern through the width and height. Here I'm showing how I folded the pattern over to make the width smaller. If your pattern is made out of paper you can simply cut it in half, remove a small amount, and tape the edges back together. Here I made the height smaller by folding the pattern twice as I did with the width. I've cut the pattern out of PUL, the pattern is cut on the fold, make sure you read the pattern markings to insure you put the correct side of the pattern on the fold so that the seam allowance allows for the bag to symmetrical. Fold the wet bag along the fold line with right sides together. Pin along the two long raw edges and sew with a straight stitch and a 1/4" seam allowance. 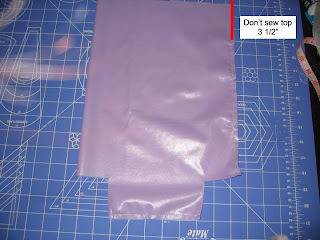 IMPORTANT: Do NOT sew the top 3 1/2" at the top of the long seam of the wet bag. Hint: I know at other times I've said not to use pins with PUL (and you certainly don't have to when you make your wet bag) but I find it much easier in this case and since I don't plan on filling my wet bag with water, a few pin holes along the edges makes no difference. 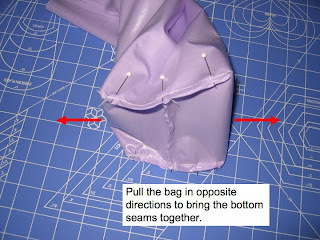 Pull the bottom of the bag in opposite directions (see red arrows) to bring the bottom seams together. Pin and sew each seam with a straight stitch and 1/4" seam allowance. The seams will have diagonal ends (its designed that way, don't worry you did it right! ), make sure you sew right to the very edge or over a little, so that the corners will be sharp. Turn your iron on hot and lay your wet bag on your ironing board with the top edge facing away from you. Open the top seam that you didn't sew and fold it flat along the seam allowance. Lay some parchment paper right over the seam and place your iron on top, leave it for 15 seconds. PUL has this amazing quality that it permanently sticks to itself when ironed with the shiny sides touching! Hint: I'm too afraid to lay my iron right on the shiny side of the PUL but you are welcome to try:) I'm sure other things would work if you didn't have parchment paper. Wax paper, regular paper...? Removed the iron and the parchment paper to find a nice, permanently folded edge. Fold over the raw edge (top) of the wet bag by 1/4" and then 1" to form a casing for your drawstring. Sew along the edge of your fold with a straight stitch as close to the fold as possible. Take a shoelace ($1.23 for two 36" shoelaces at Walmart) and put a safety pin in the end. Feed it through one end of the casing all the way around to the other side. Grab both ends and put them inside a toggle (two holed, bought at Joann's), tie a knot at the very end of the shoe laces so the toggle can't come off. Now you have a complete wet bag! Great pattern!! I can't wait till I get some PUL to try this out! This may be a stupid question, but is the shiny side on the inside or outside? Not a stupid question! The shiny side goes on the inside, that way no moisture can be absorbed on the inside of the bag. Hi, this tutorial looks great. I am going to attempt to make it, but using a lightweight ripstop fabric. Can you tell me, if I wanted to have that as a lining and a cotton on the outside, do I simply just sew the two fabrics together as per the pattern?